Enrique Lopez is a graduating senior at Hawthorne High School. His two passions are his education and serving his community. He is an International Baccalaureate Diploma Candidate attending the University of California Berkeley in the fall. He has served numerous hours through Rotary (Interact) and most recently, as a Wish Granter for the Make A Wish a Foundation. 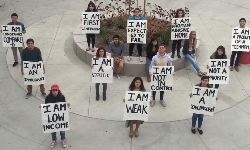 Enrique created the Resilience event, which took place on May 21st at the Centinela Valley Center for the Arts, to motivate and inspire the youth of the community. Hawthorne High School Alum stood on stage to share their experience. Their story of diverse backgrounds, communities, conflicts, resilience, education and success related to the audience of middle school students and high school students. He hopes that Resilience will become an annual student-produced event in the years to come.